Craig Bohl, the head coach at Wyoming, spent over a decade as the head coach of FCS powerhouse North Dakota State, and after sitting down and re-watching the Wyoming game again last week, it’s clear that he has stuck with what works for him, bringing his offensive playbook with him from the FCS level. Part of the thinking when you go in as a huge underdog is that you want to shorten the game as much as possible. The longer the game goes on, the more likely it is that the more talented athletes on the other sideline will outperform your (usually) less-talented athletes. Wyoming is an FBS football program on the rise, but they simply do not have the talent in this game to run up and down the field with Oregon. So what’s the answer? Stick to fundamentals, and keep the game plan simple so that your athletes can just play. The run schemes we’re going to go over in this article share some similarities with what we talked about last week, when we broke down what Ohio State did so well on the ground against the Oregon defense. The offense starts out in a twins formation before moving the tight end and fullback (who is really a second tight end) to the opposite side of the formation and creating an unbalanced look. 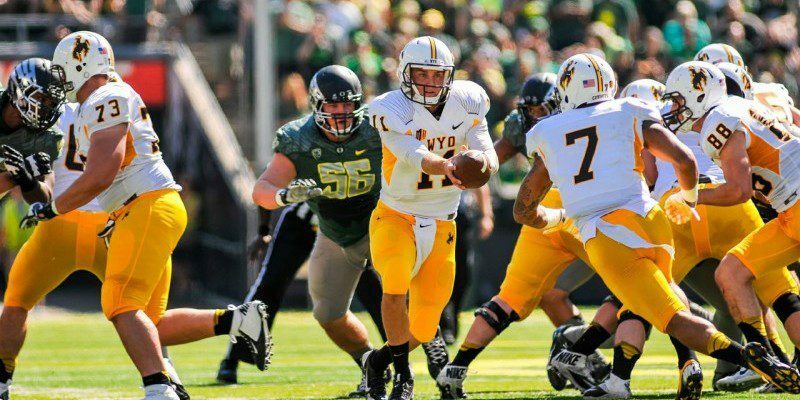 This play embodies everything about the offense Craig Bohl brought with him from North Dakota State. There’s shifting, motion, misdirection, and a downhill running attack. As you can see in the first diagram (above), the offense shifts two men to the right side, with the tight end becoming ineligible by virtue of his being covered up by the receiver on the line of scrimmage all the way to the right side of the field. The extra tight end now lines up as a wing on the same side, and forces the defensive front to shift over, though the defensive end to the strong side doesn’t seem to get the memo, because he stays put in his original spot lined up over the right tackle. 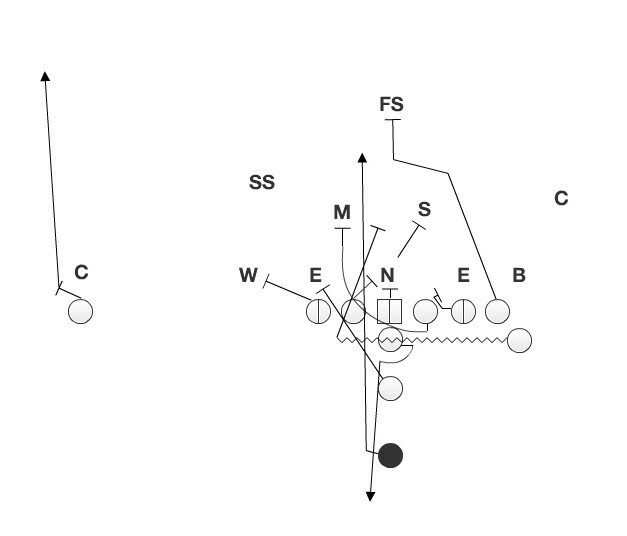 The counter play, coupled with the jet sweep motion by the receiver causes the defenders at the point of attack to widen and opens up the running lanes. Then, just after the formation is reset and the tight ends are comfortable in their new positions, the slot receiver starts in motion across the formation, and is in perfect position at the snap to fake a jet sweep with the quarterback. The jet sweep fake widens the linebackers near the point of attack, and also affects the free safety as well, forcing him to widen far enough outside that he’s in a poor spot to defend a run up the middle like the one here. It’s also interesting to note that Oregon’s defense didn’t exactly do a perfect job of reacting to the movement before the snap, so it’s definitely something you make a note of. When your back is against the wall, sometimes you’ve gotta go with what brought you there. Just like the last play, the offense uses pre-snap movement and a downhill running style to pick up some big yards and get itself out of trouble after lining up in the shadow of its own end zone. The combination of the pulling guard and the tight end blocking in the opposite direction creates a numbers advantage in the B gap. The Sam linebacker (above) is in a bind on this play, since he has two conflicting keys to worry about. At first, he sees the tight end motioning back into the backfield and adding himself as an extra blocker. At the snap, the tight end appears to head in one direction, while at the same time, the left guard aligned across from him pulls around into the opposite A gap. In this case, the Sam hesitates in his spot, and doesn’t follow the pulling guard into the hole, meaning that the defense is a man short on the weakside. The only thing standing in the way of the back hitting his head on the goal post is the free safety, who along with the corner forces this play to the sideline. A ton of blockers at the point of attack! It should be noted that Craig Bohl prefers to line his tailbacks up about a yard deeper than most teams, with their heels nearly at eight yards at times. This accomplishes a couple of things, one being that the back has more room and has more of an ability to see the defense once he’s got the ball, and it also gives him extra room to pick up steam on these A gap runs. This shares a lot of traits with the previous play we examined, only this time the tight end motion man is going in the same direction as the rest of the play, and is an extra hat in the hole. 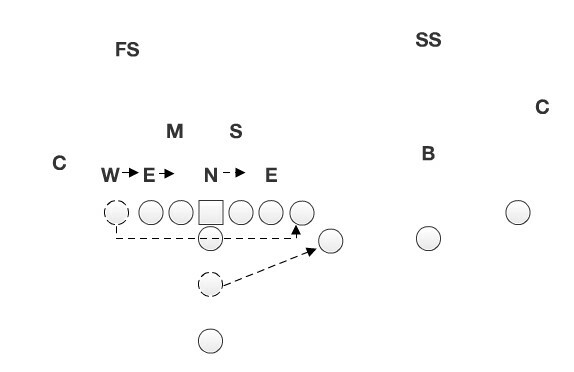 It doesn’t really matter what you call it, but enough coaches refer to this scheme as a “blast” play to differentiate it from base power schemes. The beauty of this play is that it gets three men into the same gap, between the guard and the tackle. On paper at least, it means that there will be two double teams at the point of attack. The first happens at the nose, being blocked by the left guard and the center, the second happens to whoever the first linebacker is to meet the blockers in the hole. 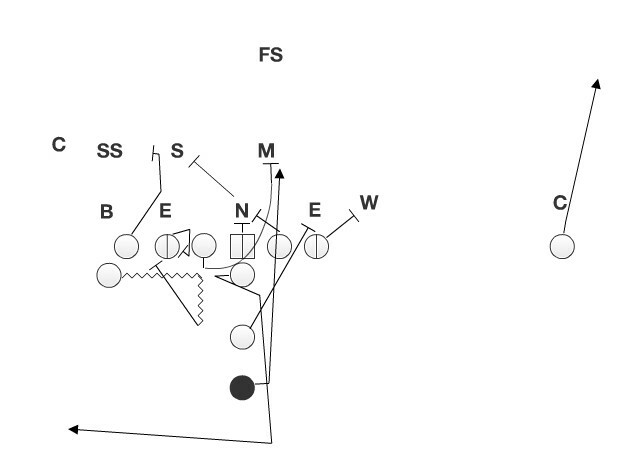 Wyoming puts three blockers into the B-gap to overwhelm the defense at the point of attack. The second tight end will serve as an additional lead blocker through the hole, and the motion from the right to the left forces the strong safety to come down to the field side and keep the defensive front gap-sound. However his wide alignment renders him completely ineffective against this play because of the wall formed in the interior of the formation that seals off every defender wider than the B gap. So many blockers brought to the point of attack! In this particular instance, the defense is especially aggressive, and the right guard ends up kicking out the Mike linebacker, who flies down into the hole once he sees the combination of the left tackle blocking out on the Will linebacker and the left guard blocking down on the nose tackle. 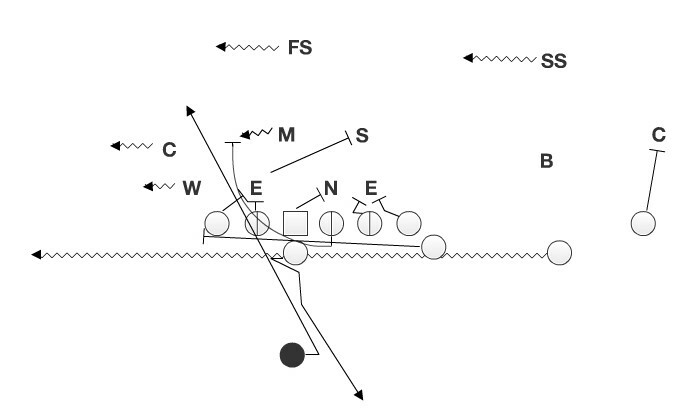 This is the genius of the play design in Wyoming’s playbook, that tells the defense that the ball is going up the middle, come hell or high water. There’s no question that Wyoming came in with a solid game plan. There’s a reason Craig Bohl won three straight FCS National Championships at North Dakota State. His offensive system specializes in winning the battle up front, and using not only brute force to move the ball, but also by playing his own version of the numbers game in the interior of the offensive line. On his site, LifeAfterFootballBlog.com, Alex is releasing a play-by-play breakdown of the National Championship game on Friday in PDF format. He will be offering signed copies of his first two books, “Speed Kills: Breaking Down the Chip Kelly Offense” and “Inside the Auburn Offense.” Alex is also the creator of the site, DrawFootballPlays.com of which provided the diagrams above and is a superb tool for coaches and writers to use in their football diagramming.